The National Energy Regulator of South Africa (Nersa) announced today that it had rejected Eskomâ€™s application for a 9.58% increase in electricity prices from 1 July, in addition to the 12.5% increase it was granted on 1 April (which was granted). Last week Nersa held public hearings on the proposed tariff increase, during which business, farmers, and other stakeholders made presentations stating their case for the hike in tariffs to be denied, as increased prices would harm their businesses. On the face of it,Â it would seem to be good news that electricity prices wonâ€™t be escalating even further (for now). 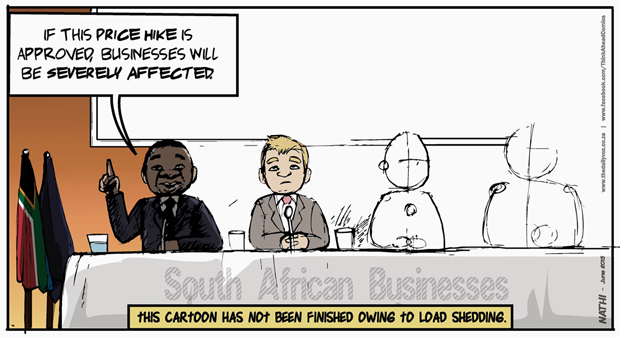 But no tariff increase means more load shedding, a situation that also affects big business, industry â€“ and all South Africans. Hell, even our own Daily Vox cartoonist struggles to complete his work when heâ€™s left in the dark.